Getting behind the wheel of a vehicle that is built to perform is a thrilling experience. When that vehicle also includes numerous other beneficial features, then driving moves beyond the simple thrill into the realm of genuine pleasure. The 2019 Dodge Charger is built with features that place it in the realm of pleasurable vehicles to drive. Once you hit the streets of Winnipeg, it won't take long to appreciate all that the 2019 Charger offers drivers. To help you maintain focus on the road, the integrated Voice Command and Bluetooth Streaming Audio allow you to control everything with your voice. Drivers are able to place and answer calls, navigate and select music, and change radio stations all with the sound of their voice. 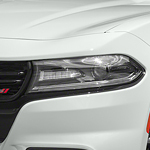 The Charger is also equipped with Adaptive Cruise Control with Stop. This system has the ability to make automatic adjustments that keep the distance between the vehicle ahead unchanged. This is achieved through throttle control and applying the brakes in a limited fashion.